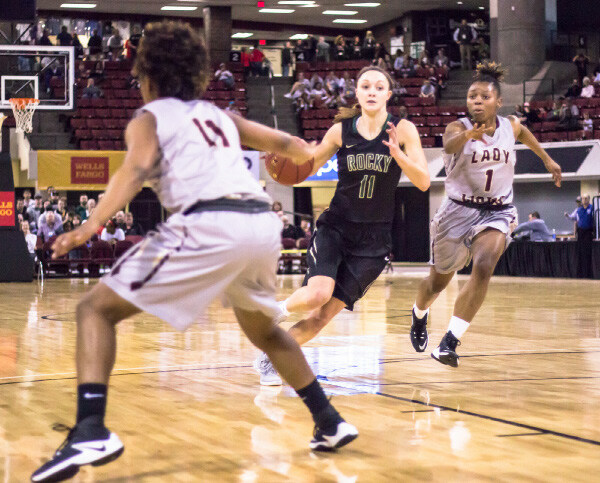 RMC women’s basketball team competed at the NAIA national tournament, but ended up losing in the first round. Photos by Nicolas Cordero. The Rocky Mountain College basketball teams wrapped up the regular season on the road against the University of Great Falls and Montana State University Northern. Both the men’s and women’s teams fell in the first round of the Frontier Conference playoffs. 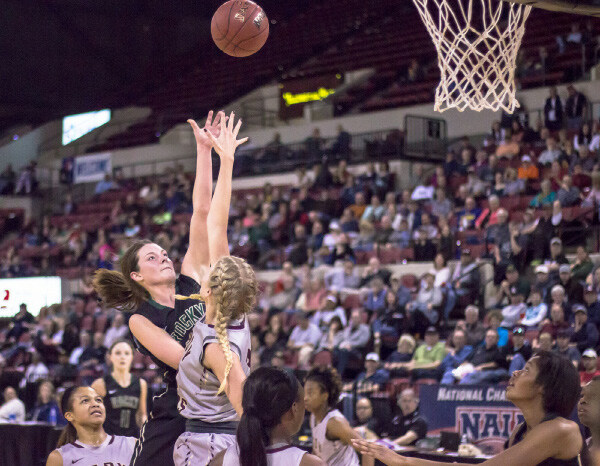 The women’s team, who received an automatic bid for hosting the tournament, fell to the number one team in the country in the first round of the NAIA national tournament in Billings. On Feb. 24th, the women walked away with a 63-62 win over the University of Great Falls. Four team members of the women’s basketball team scored double digits. Sophomore Hailee Farstveet led the women with 14 points on the night. Sophomore Alecia Chamberlain and junior Keisha Engelhardt both scored 11 points, and sophomore Justyn Juhl scored 10 points. 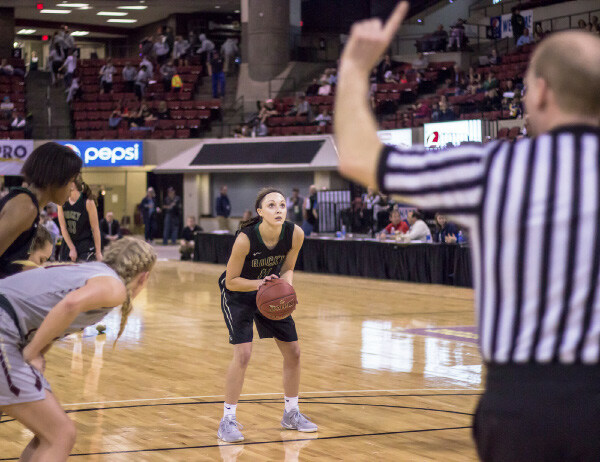 As a team, the women were 40 percent on field goal attempts, 33 percent from the three-point line, and 50 percent from the free throw line. The women were not able to keep the momentum going the second night, and fell to Montana State University Northern 49-53. Sophomore Hailee Farstveet and freshman Markaela Francis scored 14 points each. The women fell in the first round of the NAIA playoffs to Montana Western with a final score of 47-76. With the NAIA national tournament taking place in Billings, the women had a home court advantage against the number one team in the country, Freed-Hardeman, from Tennessee. The game was held at the Rimrock Auto Arena on March 15th. The women fell to Freed-Hardeman 52-62, bringing their season to a close. The Rocky women’s basketball team nished 13-19 overall. The Rocky men’s team fell to the University of Great Falls 71-75 on Feb. 24th. Senior Taylor Longo led the Bears, scoring 24 points on the night. Senior Zachary Hinton scored 15 points and senior Riley Bradshaw scored 12 points. The Rocky men’s team bounced back the following night against Montana State University Northern, beating the Lights 75- 58. Four of the men scored double digits on the night. Senior Riley Bradshaw led the Bears with 17 points, seniors Zachary Hinton and Taylor Longo scored 12 points and 11 points respectively, and junior Chad Kananen scored 13 points. The men were 49 percent on eld goal attempts, 47 percent for three point attempts, and 75 percent for free throw attempts. The men fell in the first round of the Frontier Conference playoffs to Montana State University Northern 71-54, bringing their season to a close. The Rocky men’s basketball team finished 16-15 overall.